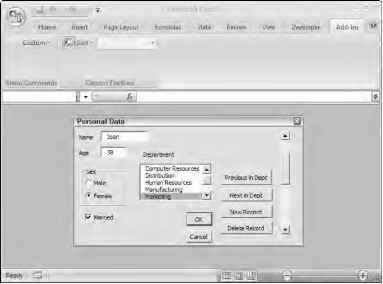 The Visual Basic for Applications programming language is common across all the Microsoft Office applications. In addition to Excel, you can use VBA in Word, Access, PowerPoint, and Outlook. Once you learn it, you can apply it to any of these. However, to work with an application, you need to learn about the objects it contains. In Word, you deal with documents, paragraphs, and words. In Access, you deal with databases, recordsets, and fields. In Excel, you deal with workbooks, worksheets, and ranges. Unlike many programming languages, you don't have to create your own objects in Office VBA. Each application has a clearly defined set of objects that are arranged according to the relationships between them. This structure is referred to as the application's object model. This section is an introduction to the Excel object model, which is fully documented in Appendix A.